When most people think of drug users, they think of the stereotypical addict who is passed out on a curb somewhere with their life in shambles, but that isn't necessarily accurate. There is a growing number of workers who are contributing members of society that just like to get loose on the weekends and enjoy a little cocaine safely. To aid in this endeavor, drug users are turning to wearable smart technology like Apple watches and Fitbits to monitor their heart rate while they are high. The idea may sound a little ridiculous, but one cocaine user who CNBC refers to as Owen describes using his Fitbit to monitor his heart rate while doing cocaine with his friends. He noticed that after doing some lines of the drug, his heart rate jumped all the way up to 150 beats per minute which is very high when you consider he had been sitting for hours. "My heart rate only gets to 150 if I'm running, like really intense physical activity," Owen said. "If I'm in a really stressful work meeting, I might get close to 100 or 120." Owen had been taking turns with his friends and doing a line every 15 minutes. 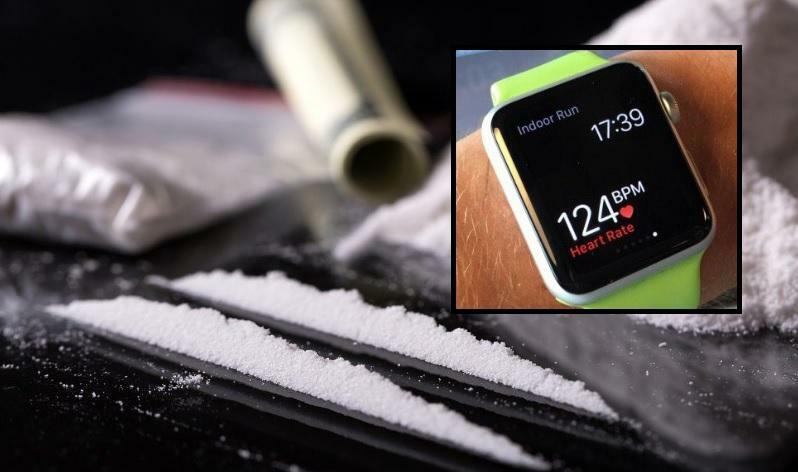 To test out his Fitbit and make sure it was working he gave it to one of his friends who had just entered the room and wanted to see what would happen after his first line of cocaine. About 20 minutes after doing the cocaine, his friend's heart rate when from around 80 to 150. "I think we all knew it would have an impact on our heart rate, but we'd never seen it happen before," Owen said. "It became interesting to keep an eye on." Owen's story is similar to another 23-year-old drug user named Nick who works at a restaurant in Nevada. Nick got a Fitbit last Christmas and noticed the morning after a night of drinking and cocaine that his heart rate had surged to about 115 the night before. "I noticed that I was at a bar when the spikes happened," Nick said. "There wasn't anything that could have caused the heart rate increase except for the drugs." A cardiologist and associate professor at the University of California named Ethan Weiss said heart rhythm and blood pressure are always impacted by cocaine use and while using a smart device to monitor them may be helpful it is still "Always a risk". Owen said his Fitbit has become an important factor when he decides to use cocaine. "If someone says, 'Let's do a line,' I'll look at my watch. If I see I'm at 150 or 160, I'll say, 'I'm good.' That's totally fine. Nobody gives you a hard time."